Elise is always wanting to learn and she is really great at recognising her shapes and colours. She can pretty much name any shape and colour that she sees and it is so lovely to see. Although she was a late walker, she has always been interested in learning and speaking. In fact she never stops talking! One of the companies that we love, and have found great for teaching Elise new things is Orchard Toys. 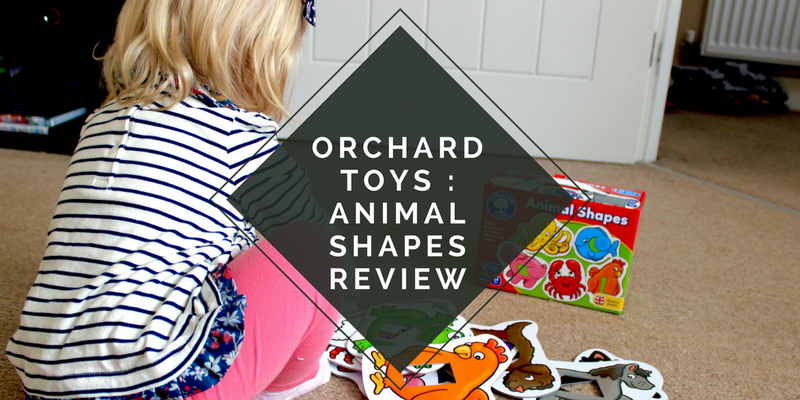 We have already reviewed their Farmyard Heads and Tails game so when Orchard Toys asked if we would test out their new Animal Shapes game we jumped at the chance! When Elise first saw the box for this game she couldn't stop saying "Wow mummy wow". She wanted to open it straight away and see what was inside. As soon as we opened the box she was calling out the names of the different animals. When I started popping out the shapes from the middle of the cards she soon join in. I noticed that there is a huge variety of animals within the box, and all the animals are the correct colour. I'm not a fan when toys are not the right colour as I think that it can be confusing, especially when little ones have just started learning about colours. There was a mix of household pets, farm animals and sea creatures so this kept Elise interested. There was a large range of shapes too, some easy shapes like circles, and then other shapes like a trapezoid. 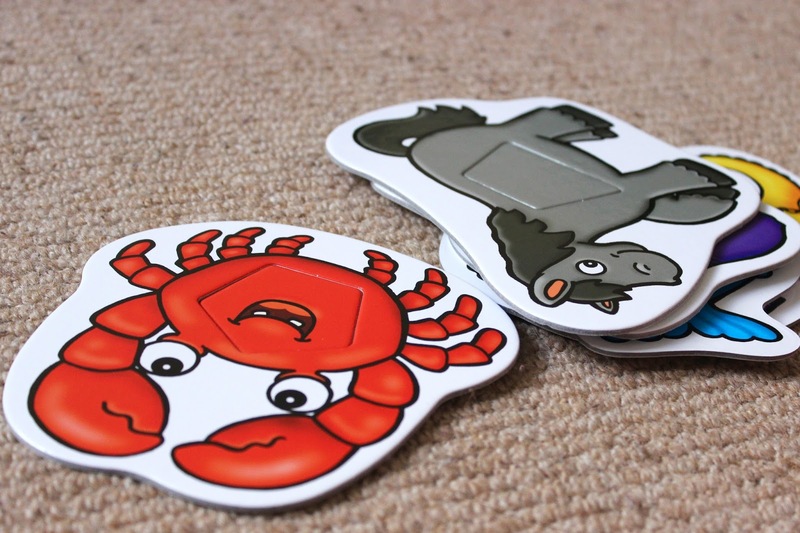 The animal cards are amazing quality and the shapes slotted in nicely into the centre. We did find that a few were a bit stiff to start off with but after playing with it multiple times they became a bit easier to use. 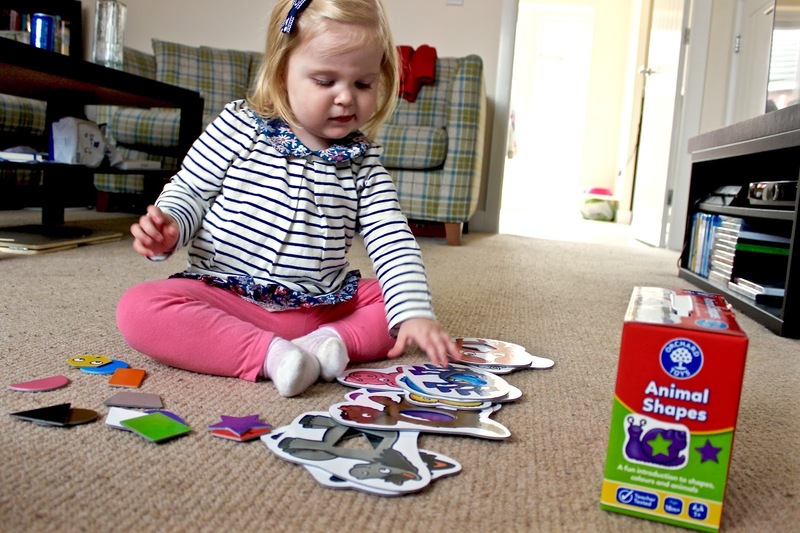 The cards are nice and large, as are the shapes which is perfect for little ones as they are easier to hold and see. As I said the animal illustrations are really great and they use the correct colours for the animals. The animal shapes can be used for a variety of activities. You can simply name the animals and colours, or you can match the shapes with the animals and slot them into the middle. The game is aimed at children 18+ plus and they can either play it alone or with other people. We found that Elise was happy to play with this by herself and didn't have much of a problem slotting the shapes inside the animals. (Elise was 22 months old at the time of this review). 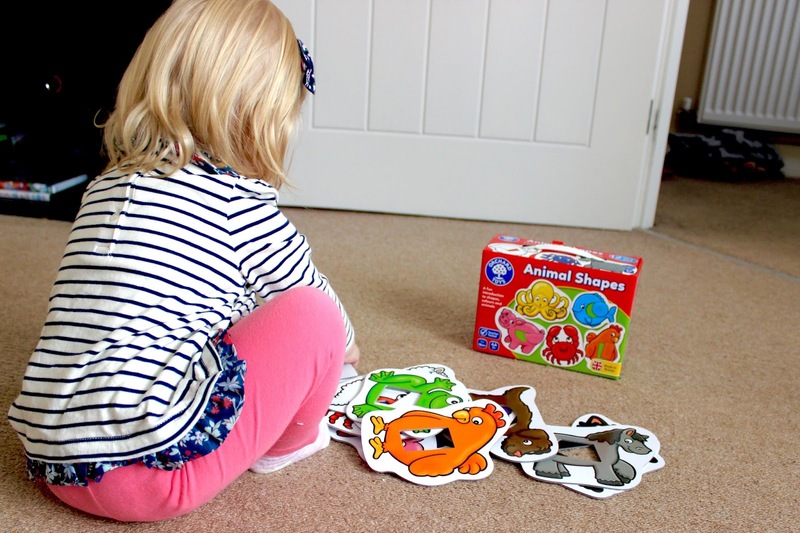 The Animal Shapes game includes 12 different animals and shapes in a variety of colours. 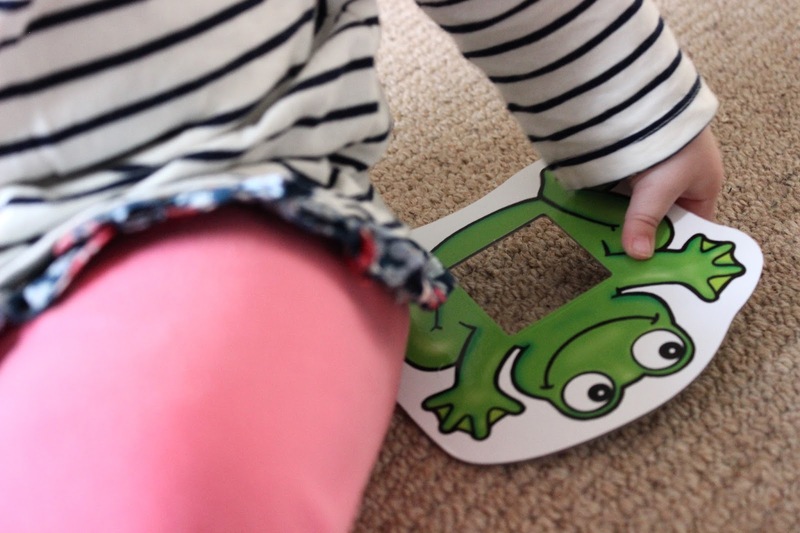 Some shapes are more difficult than others so discussing the shapes with your child can be just as much fun as playing. We also enjoyed hiding the shapes around the room and then Elise went to find them. We also called out colours so that she could match the colours together. Elise also enjoyed making the different animal sounds and naming them. 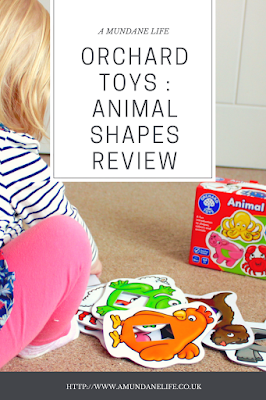 The Animal Shapes game has many benefits to it, just like all of the games from Orchard Toys. 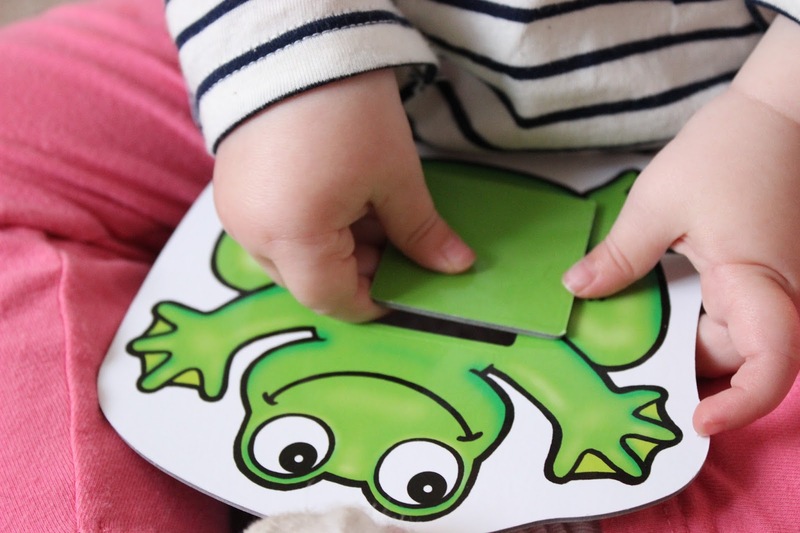 This game in particular helps with hand eye coordination, colour and shape recognition, encourages discussion and helps your child learn matching skills. We also found that this game really helped to get a discussion going as Elise wanted to talk about each of the animals. It helped her learn to share and also how to get involved in a more complicated game with hiding the pieces for her to find. Overall I think this game is great for developing hand eye coordination and colour, shape and animal recognition and I would highly recommend it. We loved this game just as much as the Farmyard Heads and Tails game, although I must admit that Elise keeps her focus and attention a bit more with the Animal Shapes game. I think that the age rating is suitable and Elise would have been able to play the game even at 18 months. I love the range of animals included as lots of games just have farm animals, but this one includes animals such as an octopus and a frog. The colours are nice and vibrant, and the actual drawings are great quality. I love that the cards are nice and thick as it will last with a toddler playing with it. I also think that the shapes will last as they are made of the same material as the main cards. It's easy to store the game in the box and because the shapes slot inside the animals, I think it would be quite hard to lose them. All Orchard Toys are made in the UK so they are easy to find and are sold by most toy retailers. You can also find them on Amazon. The main place to find the Orchard Toys games is on their website, and you can find reviews of all the different products on there. What is your favourite Orchard Toys game? What one should I try next? WE WERE SENT A COPY OF THE ANIMAL SHAPES GAME FOR THE PURPOSE OF THIS REVIEW. THIS WEBSITE USES AFFILIATE LINKS. FOR MORE INFORMATION, PLEASE READ MY DISCLOSURE POLICY.